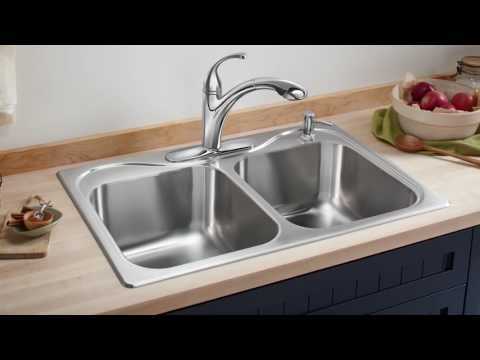 Under-Mount Large/Small Kitchen Sink, 31-1/2" x 20-1/2" x 9-5/16"
The beauty of stainless steel combined with the versatility of a deep, offset sink creates a winning combination for any kitchen. SilentShield(R) technology, an exclusive sound-absorbing system, reduces noise and vibration. An optimized front-to-back dimension maximizes the amount of countertop material behind and in front of the sink. The beauty of stainless steel combined with the versatility of a deep, offset sink creates a winning combination for any kitchen. SilentShield© technology, an exclusive sound-absorbing system, reduces noise and vibration. An optimized front-to-back dimension maximizes the amount of countertop material behind and in front of the sink.